The story of the winter Festival of Lights is well-known among Jews and non-Jews alike -- candles or oil wicks are lit each of eight nights to commemorate the reclaiming of the Holy Temple from Greek desecration and the powerful empire's attempts to stifle Jewish adherence to the Torah. Once the Temple was re-sanctified, there was only enough pure oil left to last for one day, yet it miraculously lasted for eight days. 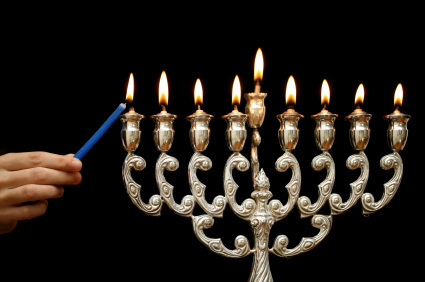 Chanukah accordingly is a celebration of miracles.The miracle of a few inexperienced Maccabees defeating a huge, powerful army. The miracle of one small jar of pure oil lasting for eight days instead of one. The miracle of the survival of the Jewish people for thousands of years despite endless challenges and obstacles. These miracles also represent a choice. A choice that Mattisyahu made when he announced, "We will fight!" A choice that the Jews made when they searched through the Temple ruins and said, "We will create light." And a choice made by every Jew: We will go on. Here are eight ways to turn the darkness into light. 1. Practice kindness. Go out of our way to help people. Smile often. Compliment others. And remember that we can't genuinely be kind to others if we don't know how to be kind to ourselves. 2. Reframe your goals. Instead of thinking about what you don't like about yourself or your life, focus on what you do want. For example, instead of worrying about not having enough money, create positive mini-goals to earn more. 3. Living "as if." Many of us want to achieve specific goals in order to feel a certain way. We want the promotion so we can feel secure. We want a prestigious title so that we can feel powerful. We want accomplished children so that we can feel proud. We don't need to wait until we have accomplished a never-ending list of goals to feel good about our lives. Act as if you already have everything you need. Feeling and living 'as if' we are living our best lives illuminates the path towards actualizing more and more of our potential. 4. Thinking creatively. Too often the possibilities in our lives appear very narrow. Take a step back and ask often: What's the best that can happen in this situation? Think out of the box and consider a whole list of solutions and ideas. The more we learn to see past the limits of who we used to be, the greater space we make for light within us. 5. Look through a spiritual lens. The material world is bounded by scarcity and limitations. Peering at life through a physical lens, we see heaviness, exhaustion and often chaos. But the spiritual world, which simultaneously surrounds us and pulses within us, is expansive and abundant. It is a source of constant energy emanating from the Source of all energy. Everything has a purpose; there is order within the chaos. There is light that pierces the weight of doubt. 6. Embrace change. When stuck in habits and routines, life can seem boring and impossible to change. But change can happen at any moment, and create profound implications. Recent research in epigenetics -- the study of how genes can be affected later on -- reveal that even our DNA, which we had previously thought of as immutable, can change in our lifetimes. If we grow and work on our character traits, we can suppress the expression of harmful genes and turn on the expression of healthy genes. Embracing change will not only bring more light into your own life but can last for generations to come. 7. Connect to G-d. Part of creating and sustaining a relationship with G-d is believing that He loves you, that He believes in you and that He wants to be close to you. Faith is not just for helping us through the hard times. It is the daily building of a belief system in which we can connect to G-d when we're happy, when we're sad and when we're everything in between. Bring the light of that connection into every day. Eight days, eight lights. Against all odds, we make a choice to invite miracles into our lives and discover ways to light a candle to dispel the darkness. the darkness.